My name is Adam, and I’ve worked in the Lizard Lab for just over a year. Most of the time, the students in the lab work on our own research projects, but last week our lab had a huge project which involved every lab member. We’re trying to understand how a hormone called testosterone affects lizard behavior, and how testosterone influences how their muscles work. Earlier in the summer, we did simple surgeries to give some lizards extra testosterone, and we removed the testosterone from other lizards. Another set of lizards have their normal amounts of testosterone. We wanted to see how lizards with different amounts of testosterone react to other males and females. 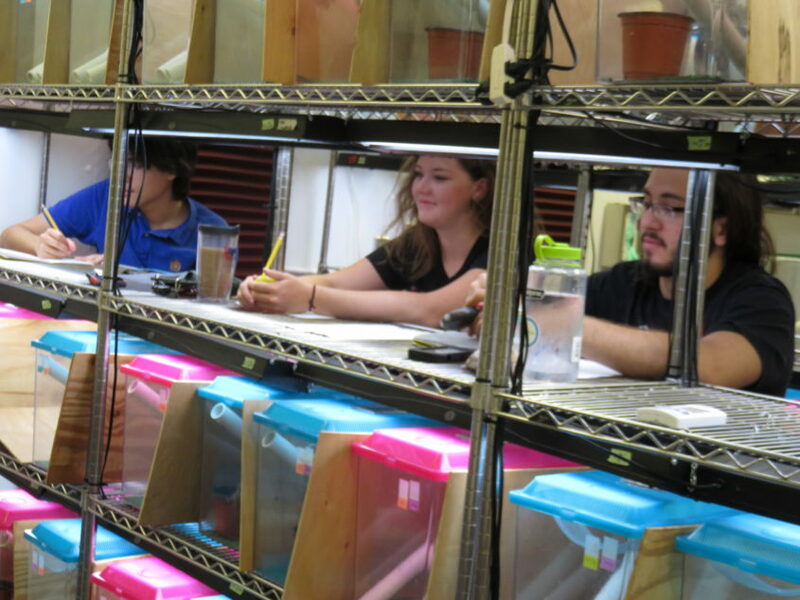 We had to run lots of behavioral trials with our lizards, so everyone spent most of their days last week helping with these trials. Lizards displaying in a male-male trial. We started the week running trials with two males (or, male-male trials). In our experiment we put two male lizards in a cage and watched how they interacted with one another. 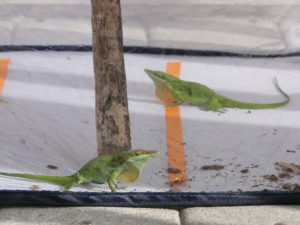 Usually, when two male anoles are placed in a cage together they “fight.” This doesn’t mean they attack or hurt each other (but if a lizard appears to be in danger of getting hurt, we immediately end the trial). Instead, they fight by displaying at each other, using push-ups and extending their dewlaps (their colorful throat fans). Our trials lasted 10 minutes, and during each trial we counted the number of times the lizards moved around the cage, their push-ups, and dewlap displays. Some of the pairs didn’t do anything during the trials, mostly sitting in one spot or just walking around the cage for the entire 10 minutes. On the other hand, some pairs were very active and chased each other in circles or dewlapped 100 times in the 10 minutes. (I’m not kidding! That’s a lot of dewlaps!) Watching a lizard do nothing can be very boring, but it can be hard to keep up with a lizard that never stops moving! 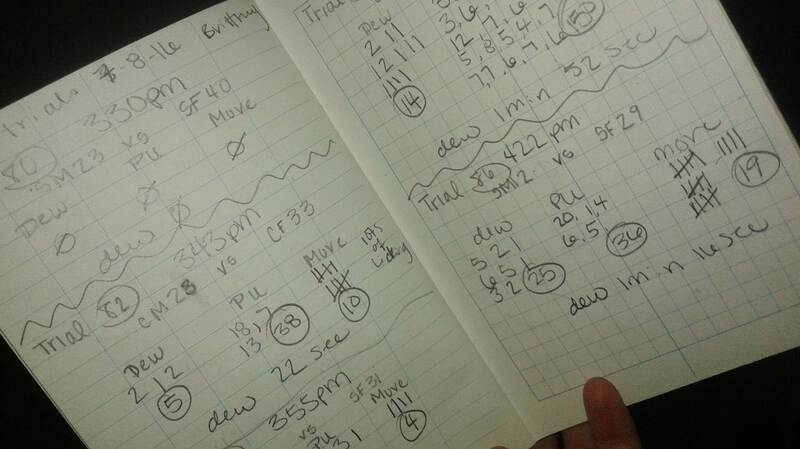 After we completed all the male-male trials, we ran male-female trials. In this type of trial, we put male lizards in a cage with a female lizard and observed how they interacted. Just like in the male-male trials, we recorded movements, pushups and dewlaps. But in these trials there’s no fighting. Instead, the male is attempting to gain the female as a mate, and the female rejects or accepts the male. I always cheered for the male to get a mate! This project is pretty cool, and also a little complicated. Even though we are done running trials we won’t know how testosterone affects behavior until our data are analyzed. That’s another blog post for another day. For now, running all of those trials took a lot of hard work and cooperation. I know our results will be interesting, making this entire week very rewarding! Adam is a college student studying biology. He's from Austin, Texas, and he's planning to go to medical school after college.